Dry skin got you down? Stop everything and read on. We scoured the web for the top skin care hacks beloved by YouTubers, bloggers and beauty gurus alike. With any of these quick fixes, you’ll be able to add another layer of complexion perfection in a snap while also complementing your skin care routine. 1. Hail to the humidifier. When the temperature drops and the heat is cranked, dry skin is a given. Turn your bedroom into a balmy paradise with a steamy humidifier that releases moisture into the air as you sleep. 2. Go extra on the exfoliation. Dull skin? Use a gentle exfoliator two to three times a week to remove dry skin build-up, giving your complexion the smooth surface it needs to properly reflect light (a.k.a. nature’s highlighter). Give your limbs a once-over with a body oil or balm immediately after toweling off—while skin is still slightly damp—and the oils will lock in all that moisture before it has a chance to escape. Your skin can only be hydrated if you are, so keep your water bottle nearby at all times (8 cups a day, remember?). Eating foods rich in omega-3 and omega-6 fatty acids, like salmon and walnuts, can also help glow-ify lackluster skin and hair. One sure sign you’ve reached peak dryness? Cracked, scaly lips. To the rescue: regular buffing with your washcloth—apply some facial cleanser first—following by a slick of your fave heavy gloss. 6. Winterize your skin care. Replace foaming cleansers with milkier versions, and swap serums for beauty waters and richer face creams for lotions. 7. Bow to the balm. Clear lip balm is actually a multi-purpose skin saviour. To achieve a soft, glowy look, apply a small squeeze to the tops of cheekbones and on your cupid’s bow. It’s also an awesome cuticle salve. 8. Put down the powder. Choose cream-based foundations and blushes over powders to achieve luminous shine. Pro tip: Apply with fingers; the warmth will help cream formulas melt into skin. 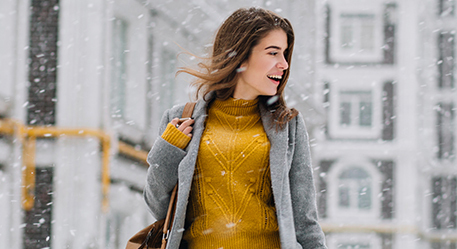 To achieve that post-vacation glow all winter long, mix a few drops of liquid highlighter with your body lotion and apply generously to legs, arms and collar bones. 10. Don’t skimp on SPF. No matter how gloomy the weather, the sun’s damaging rays never sleep—and neither should your SPF. A broad-spectrum formula with a minimum of SPF 30 ensures your complexion is always protected against the free radicals that cause sun spots and wrinkles.